William Hill are one of the world's oldest and most experienced bookmakers. Their sports betting app that also have a strong focus on horse racing offering exclusive features you won't find anywhere else. 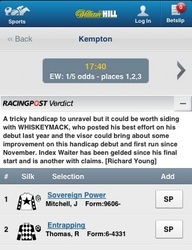 Due to bugs in the William Hill app, we now recommend PaddyPower as the best horse racing app. Works on all internet enabled phones, including iPhone, Android & Blackberry. Exclusive horse racing betting offers available only to their mobile users. 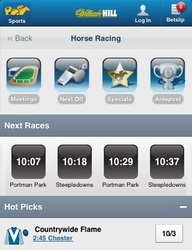 The apps detailed racecard also feature tips from the Racing Post. Place a £25 bet and receive a free £25 bet when you download the app. Hot Picks section offers quick access to the days most hotly fancied horses. William Hill is one of the oldest bookmakers in the world. The company were founded in 1934 and started as a high street bookmaker. Whilst they still host a number of high street betting shops, the majority of their custom now comes from the online world and their superb online betting site. It’s often easy for the older generation of bookmakers to get stuck in their ways somewhat, and this has certainly been apparent for a few companies switching into the online era of betting. But William Hill have managed to embrace innovation, none more so than with their latest version of their mobile betting app. The app is fully functional on all smartphone and tablet devices with William Hill providing big investment to make it the best app it can possibly be. One of the main avenues that the company prides its expertise on is that of horse racing. The sport provides a massive role in their sportsbook and, along with football, is their leading sport in terms of turnover and player activity. The huge integration of horse racing features that are packed into their betting app just underlines how big a deal the sport is to the company. 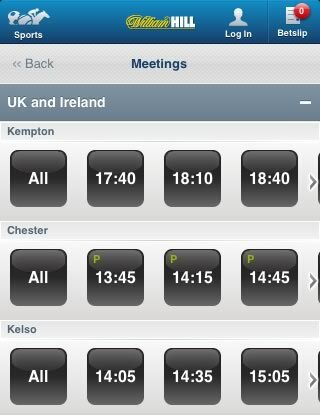 Straight from the off you can see how much horse racing is going to play apart in the app. At the top of the William Hill betting app you are greeted with a carousel of around half a dozen of the next upcoming races that William Hill is providing on their app. Alongside this is a button where you can simply view all the upcoming races for that day, and for races that have already elapsed, check the results of those. Once into the racing specific section the first you see is a list of four options that contain Meetings, Next Off, Specials and Antepost. The Meetings section allows you to oversee when and where races are taking place that day. You can flick between each meeting before selecting the race card for each race. The Next Off feature is pretty self-explanatory; it lists around 4 or 5 of the upcoming race cards that day. The Specials section is one of most favoured part of the app, with a feast of horse racing specific betting specials which can range from jockey offers, trainer offers, distance and favourites, alongside various specials from some of the larger meetings. 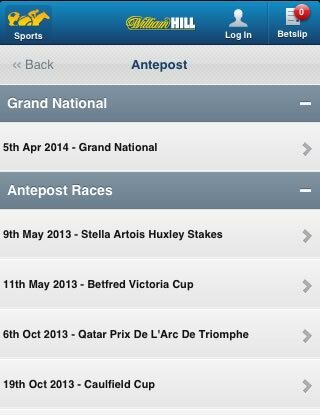 And finally the Antepost tab allows punters to view an array of future races from meetings around the world. 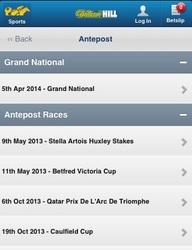 In fact, the sheer volume of races at Antepost is easily one of the biggest in the industry. Back on the horse racing home tab, the middle section is made up of an overview of the next 10 or so races that are upcoming. What this shows is the top two horses in terms of the current betting, latest odds, number of runners, location and time of the race. The final section on the home tab is our favourite; the Hot Picks section. 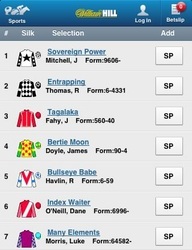 This gives you a look at some of the most fancied horses running that day. It gives you latest odds, name of the horse and when they are running. Now the interesting thing about this is that it’s not merely just picking the favourite from each race, but a selection of fancied horses ranging in price. These picks are made via the William Hill horse racing team and they are often very well-informed picks, especially for those who aren’t bothered about trawling through hours of data to find a pick for each race. It’s a really neat feature, and something a lot of other horse racing apps don’t provide. The main feature of any horse racing section on a mobile betting app has to come in the form of its race, and more importantly, how detailed it is. Now the William Hill race card isn’t as in-depth as some of its competitors, but it will provide all the information needed for the majority of horse racing punters. Let’s take a quick run through the William Hill race card. At the top of the page you will be greeted with a box that includes where the race in question you are looking at is being run and also the time of race and places paid. Now what’s good about this little section is that you can easily flick between all the races at that meeting by simply swiping across the screen and instantly coming up with the next race. Underneath that is a section taken from the Racing Post website. This is a short ‘Verdict’ on how they think the race will run and which horses they think will perform well. It’s only about a paragraph or so and is pretty limited on the information it offers, but it does come from a source that is trusted within the racing industry and will often keep you pointed in the right direction. The card itself shows the horses running along with their current price. You can also view the jockey on board along with a quick overview of their past form. Additionally you can click on the horse to find out more info including the age, weight, rating and also a more detailed spotlight view – again taken from the Racing Post – on how that horse has performed in the past and how it might fair in this race. There are also two additional picks of picking the starting price favourite and the second favourite to win, which will be determined just before the off. William Hill doesn’t have the flashiest of apps by any means. This isn’t to say it looks boring, but they have definitely taken a more functional approach rather than concentrating on the aesthetics of the betting so much. To be honest, we think this is a good thing. Usability on these apps with limited screen real estate is far more important than a flashy app that doesn’t even work, in our eyes. The horse racing section definitely follows these values and with a series of elements that are ‘swipe-able’ and ‘flick-able’ makes the section a breeze to navigate. One thing we did find on the smartphone version of the app as compared to the tablet version is that there are no expandable or collapsible borders on the smartphone version. New users to the app can take advantage of up to £25 worth of free bets. The promotion is based on your first bet amount, and will be credited from anything between £5 and £25. The amount you deposit doesn’t matter for this promotion, and is solely based on how much your first bet is worth. Your free bet will be credited to your account upon settlement of your first bet. 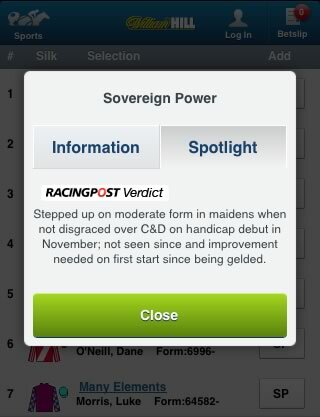 The great thing about the horse racing section on the app is that that are often mobile specific betting promotions. These include a winning distance bonus of up to 20% when your horse wins a race by 20 lengths or more (10% when 10+ lengths). Also you can get a £10 Yankee worth £10 when placed on your mobile device. When a company that has the prestige and market share that William Hill has in any industry releases a new product, you expect it to be the best. These companies have the biggest budgets, the most resources and the best people working for them, so why should it be anything less than perfect? 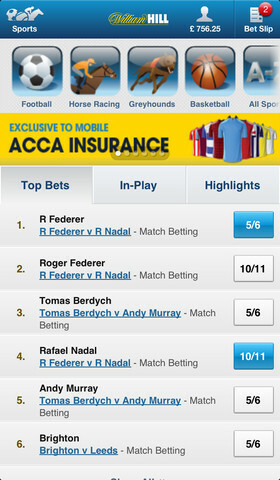 Luckily, William Hill have managed to nail their betting app. There is pretty much nothing to fault with it at all. It has a massive array of horse racing markets from around the world, a wide range of information for any given race, mobile specific horse racing offers and even free horse racing tips for its punters. The only downside to it all is that it doesn’t support any live streaming of races, which is on offer from a number of its competitors. But with that aside, the William Hill horse racing app is as close to perfect as you’re going to get!